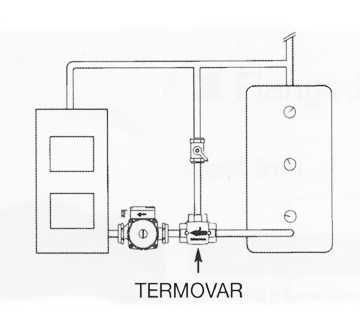 Termovar Thermic valves function using a self-contained thermostatic element. It is a tempering valve used for installations of solid fuel boilers with/without a heat storage tank. The Termovar job is to make sure that there is a minimum return of the water temperature to the heating boiler which as a result prevents condensation, increases combustion efficiency and also increases the life of the boiler. Upon startup the termover permits the temperature of the boiler to rise rapidly by keeping circulation in the boiler to the minimum until the operating temperature is achieved. This minimizes condensation of combustion products on the fireside which prevents premature corrosion of the boiler. The chances of thermal shock (caused by return of cold water from the system) is also reduced. TERMOVAR protects both steel and cast iron boilers and extends boiler life. 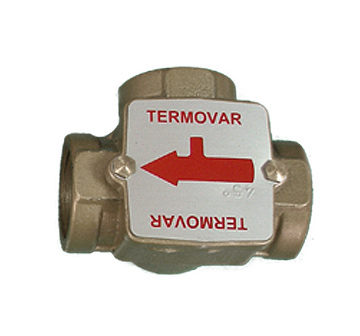 When installing, Termovar valve is fixed between the heat load in the return pipe and the boiler. To balance the flow, a ball valve is installed in the recirculation pipe (between the Termovar valve and the boiler supply pipe). A circulator may also be installed between the Termovar valve and the boiler which would be controlled by an aqua stat (to measure the boiler water). Termovar comes in sizes 12 inch to 2 inch with thermostat temperatures of 113, 131, 142, 162 and 176 degrees Fahrenheit. Using TERMOVAR is always a wise choice as it ensures that a minimum return water temperature and also ensures increase in efficiency, prevention of tarring and, as already mentioned, an increase in boiler life. Using TERMOVAR pays off in rich dividends in terms of stability and safety. There are a number of good companies that provide a good product backed up with sound technical consultation. A loading unit ensures a minimum return-water temperature into the solid fuel boiler, which increases boiler efficiency, prevents tarring and considerably prolongs the lifetime of the boiler. A loading unit also eliminates the risk of destructive thermal shock caused by surges of cold water and renders a more effective burning. The boiler quickly reaches the right working temperature. In the end phase of the firing an automatic balancing valve closes the by-pass loop. This results in a maximum supply from boiler to storage tank. Our loading units come in two versions, with or without backflow preventer. With a backflow preventer the loading unit automatically allows self-circulation of the remaining hot water to the storage tank, as soon as the fire has gone out or in case of power failure. Back flow from storage tank to heating boiler is prevented. The Draft/Firing Regulator is a self contained thermostatic expansion control device intended to regulate the temperature of solid fuel fired boilers without requiring any electrical installation or complicated linkage. The thermostatic control head senses the boiler temperature and the air damper position, controlling combustion air low. The Draft/Firing Regulator is fully adjustable within the range of 100-195°F (40-90°C). Connection is through a screwed boss directly into the boiler waterway. The Temperature Relief Valve for heating systems is a self-acting valve which is activated by the flow temperature of the heat generator. It opens and discharges water from the heat generator or condensing coil at a flow temperature of 95°C (203°F) and thereby prevents a significant temperature rise in the heat generator. Multi-fuel boilers with integral water heating or condensing coils in closed solid-fuel fired heating systems. The temperature relief valve is actuated by the flow temperature of the heat generator. It comprises a spring-loaded valve and a bellows operated temperature sensor. When a boiler flow temperature of 95ºC is reached the force exerted by the bellows system becomes greater than the force of the spring and the valve opens. Heated potable water then flows out and this is replaced by cold water from the supply network. This absorbs excess heat from the heat generator and prevents overheating.